Information Services have arranged for a demonstration, this Thursday, of the Top-Tec Synergy Air Connect group study desk. 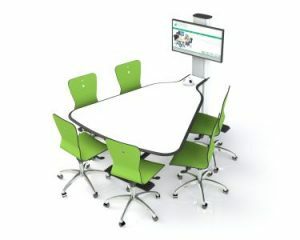 The desk has wifi connectivity to a large screen so users can project their group work onto it for all to view. This kind of furniture is being considered for the final stage in the development of the Library 24/7 Study Zone (the front section) so we are very keen to get student and staff feedback on the furniture. It will be on display in the Atrium area outside the Library / Study Zone on Thursday 27th February and all are invited to come along and have a look. This furniture is useful for use in libraries, foyers, cafes, meeting rooms and any social space where you want to encourage group learning. It could therefore have practical applications all over the university.